Excellent patient care is the foundation of a healthy smile. At Dr. Darcy Wakefield’s dental practice, we provide children’s dental services in Cambridge, OH. We take an educational and gentle approach to caring for our youngest patients, ensuring they feel comfortable at the dental office as they grow older. If you’re looking for a children’s dentist near you, contact Dr. Wakefield and her team! Setting your child up for a lifetime of healthy teeth is possible with the right at-home hygiene and routine dental visits. Many patients struggle when it comes to brushing teeth, sticking to good habits, and maintaining these important dental visits, but Dr. Wakefield’s office is committed to helping you and your children succeed. At your child’s first visit, we do everything we can to ensure they are comfortable with our office and staff. We provide them with a tour and have them meet the front office team, our hygienists, and dental assistants. Children who are initially fearful can have treatments at their pace; our dentist gently counts teeth and provides tips for parents on how to keep their child’s smile healthy in the coming years. Dr. Wakefield also provides brushing and flossing tips for older children. 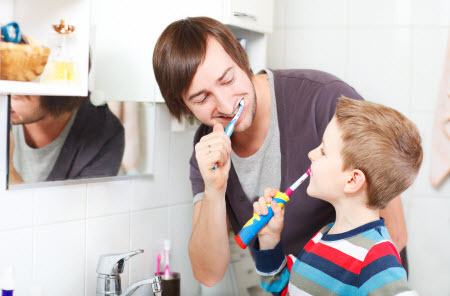 If kids have a hard time maintaining good hygiene habits, we offer ways to make this routine more enjoyable. When your child is old enough to complete their first dental exams and teeth cleaning, we welcome them back to our office for care. Dr. Wakefield can take X-rays of their teeth to determine if any signs of cavities are present. After their exam, Dr. Wakefield’s friendly staff gently cleans and polishes your child’s teeth. Our team also provides sealants and fluoride rinses at routine visits, whenever necessary. Sealants are a thin protective coating applied to the molars, which prevents the accumulation of bacteria and debris that causes tooth decay. Fluoride is also helpful in protecting teeth, as it strengths enamel against the formation of cavities. While pediatric caries, or cavities, are entirely preventable, they do happen. If your child isn’t consistent with brushing their teeth or indulges in too many sweet foods and drinks, acids can accumulate that damage enamel. Even if the cavity is present on a baby tooth, it’s important to have your child seen by a dentist, as the health of temporary teeth does affect the health of underlying, permanent teeth. Dr. Wakefield, our trusted dentist, provides white fillings, so your child’s smile looks natural and healthy. Bring your family to our office today! Contact Dr. Wakefield for your child’s first or next dental appointment.